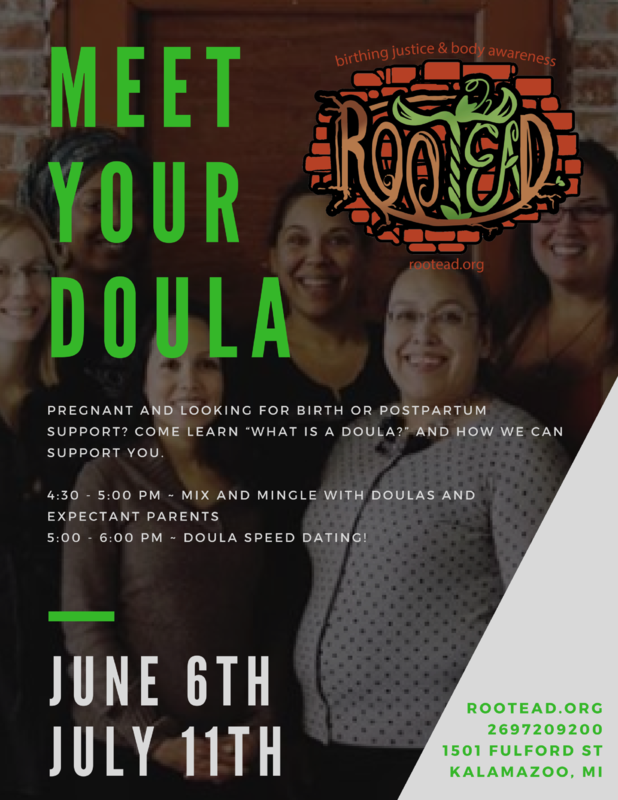 Rootead is excited to announce their “Meet Your Doula” events for Summer 2018! Rootead Doula Collective is a unique, community-based doula program that is designed to assist clients and their families in achieving the most positive and healthy birthing experience possible. Doulas provide consistent emotional and physical support for birthing mothers through out their labor. Rootead is committed to building a culturally competent, anti-racist, birth justice movement. We believe that every birthing person who wants a doula should have one and are working toward making that a reality in Kalamazoo. Join Rootead for “Meet Your Doula” events June 6th and July 11th. At these events they will answer questions like, “What is a Doula?” and “How can a Doula support me during birth?” But the most fun will be the Doula Speed Dating, mini interviews with each Doula to find the perfect “match” for each mama. Rootead is now accepting Birth and Postpartum Doula Clients.